If I had an old man like this I’d have a nervous breakdown. Though i wouldn’t be playing the piano some emo music would be just fine so we can talk about how I hate life and my dad. Just A Thought! 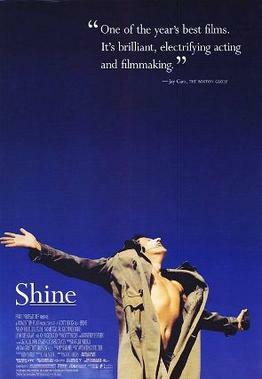 This acclaimed film paints a wrenching portrait of the life of Australian piano virtuoso David Helfgott and his struggles with his war-traumatized, demanding father; mental illness and asylum incarceration; and his obsession with the virtually unplayable Rachmaninoff Piano Concerto No.3 (“Rach 3”). This biopic is very special and true to the category of biopics. One, because it is not very cliched like many can be. Two, because it talks about more of the music than the person’s personal life. At points it seems this film was trying very hard to become a huge Oscar film which in ways it was, but there were some obvious parts. Despite this, Geoffrey Rush does an incredible job as David Helfgott and never loses a step with his constant stuttering and fast-talking. Also Francis Mueller Stahl does a fully effective job at capturing David’s unapproved father. The film does a great job at capturing the relationship between David and his father, and showing how it impact both of their later lives. A lot of the piano scenes are spectacular to look at as well and you fully feel your right there with David as he’s playing. One of the most inspirational movies I have seen in a long time and fully shows how you can beat the odds. Also Geoffery Rush is amazing in his role and that is mainly the strong point of the film despite being a little cliched. Still a great watch.